Beet noodles are truly a thing of beauty. The color is so vibrant. One look at them and you know you don't need to do much to make them delicious. This simple beet noodle recipe has only 5 ingredients that perfectly enhance the flavor of the beets. 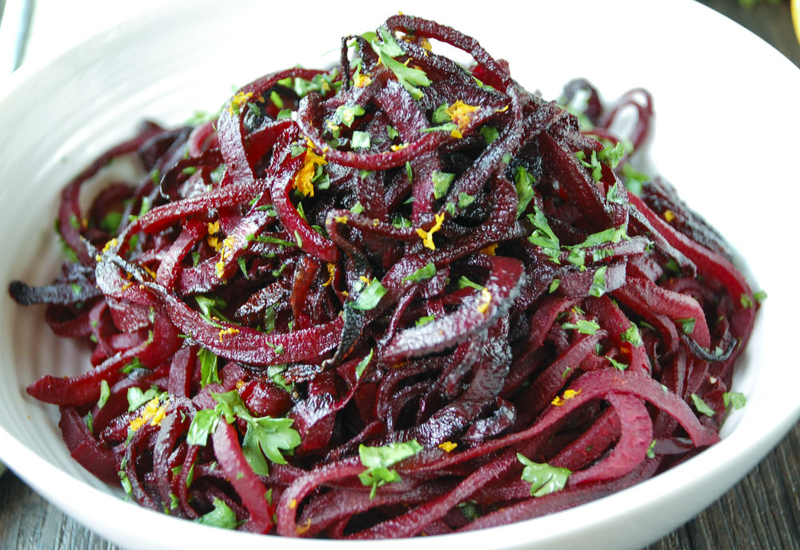 After the beets are spiralized, they are tossed with a simple blend of olive oil and balsamic vinegar. After roasting, the roasted noodles are garnished with parsley and orange zest for a burst of flavor and color. Learn how to cook beet noodles below! Roasting intensifies the sweet, earthy flavor of the beets. Because there's so much surface area on the beet noodles, they don't get very crispy. If you want to make them a little crispy, roast them for 10 to 15 minutes more, stirring and rearranging frequently. Per Serving: 79 calories; 7g fat; 4.1g carbohydrates; 1g protein; 0mg cholesterol; 22mg sodium. Not sure why I didn't get the texture or flavor from these. My wife liked them a lot more than I or the boys did. I like the idea, but it didn't quite come together for me. I love using this site for spiralizer recipes! i took the author's advice and roasted for an additional 15 minutes to make the beets crispy. i topped mine with crumbled feta because i <3 cheese and it rocked. I got my husband to eat beets! He says they taste like dirt, but the citrus and balsamic flavors were so powerful he loved it!